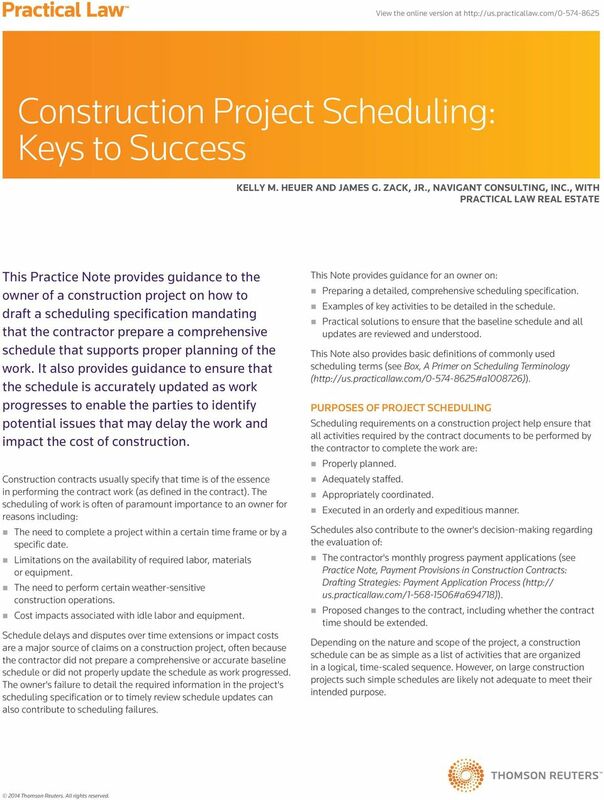 Download "Construction Project Scheduling: Keys to Success"
1 View the online version at Construction Project Scheduling: Keys to Success KELLY M. HEUER AND JAMES G. ZACK, JR., NAVIGANT CONSULTING, INC., WITH PRACTICAL LAW REAL ESTATE This Practice Note provides guidance to the owner of a construction project on how to draft a scheduling specification mandating that the contractor prepare a comprehensive schedule that supports proper planning of the work. It also provides guidance to ensure that the schedule is accurately updated as work progresses to enable the parties to identify potential issues that may delay the work and impact the cost of construction. Construction contracts usually specify that time is of the essence in performing the contract work (as defined in the contract). The scheduling of work is often of paramount importance to an owner for reasons including: The need to complete a project within a certain time frame or by a specific date. Limitations on the availability of required labor, materials or equipment. The need to perform certain weather-sensitive construction operations. Cost impacts associated with idle labor and equipment. 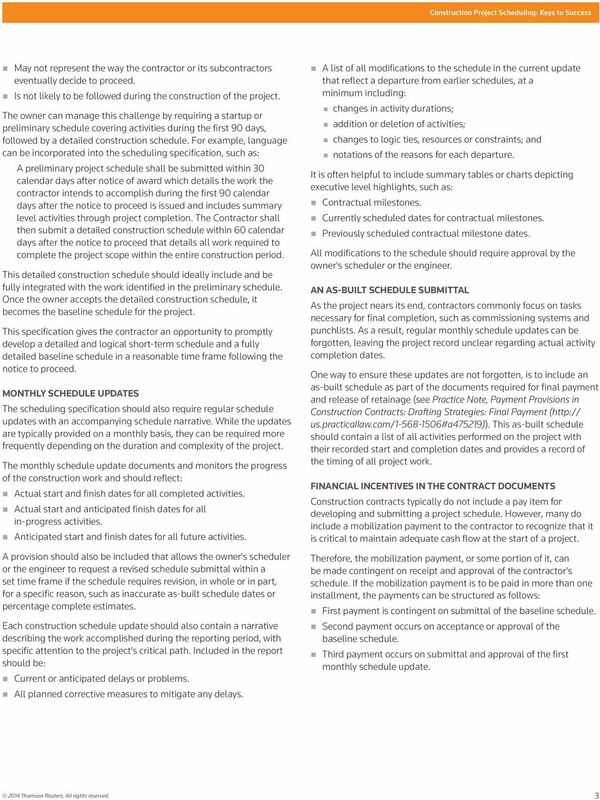 Schedule delays and disputes over time extensions or impact costs are a major source of claims on a construction project, often because the contractor did not prepare a comprehensive or accurate baseline schedule or did not properly update the schedule as work progressed. The owner's failure to detail the required information in the project's scheduling specification or to timely review schedule updates can also contribute to scheduling failures. 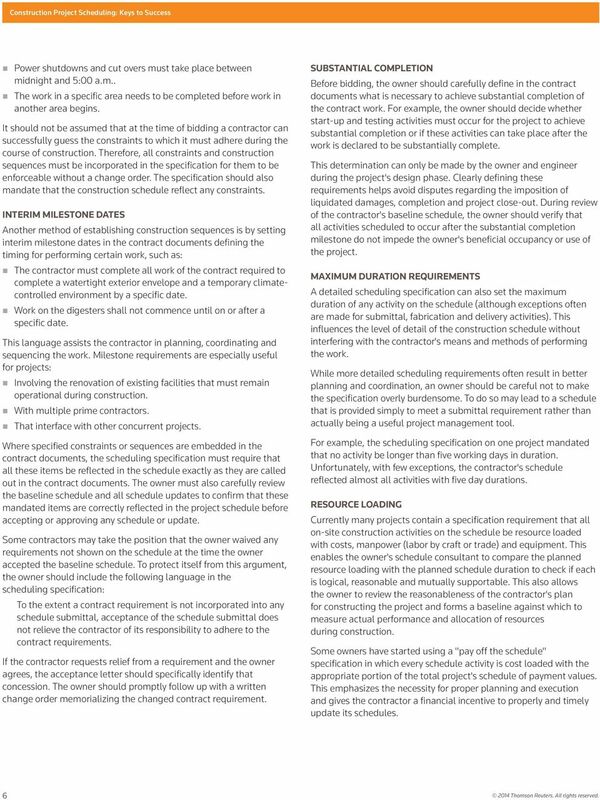 This Note provides guidance for an owner on: Preparing a detailed, comprehensive scheduling specification. 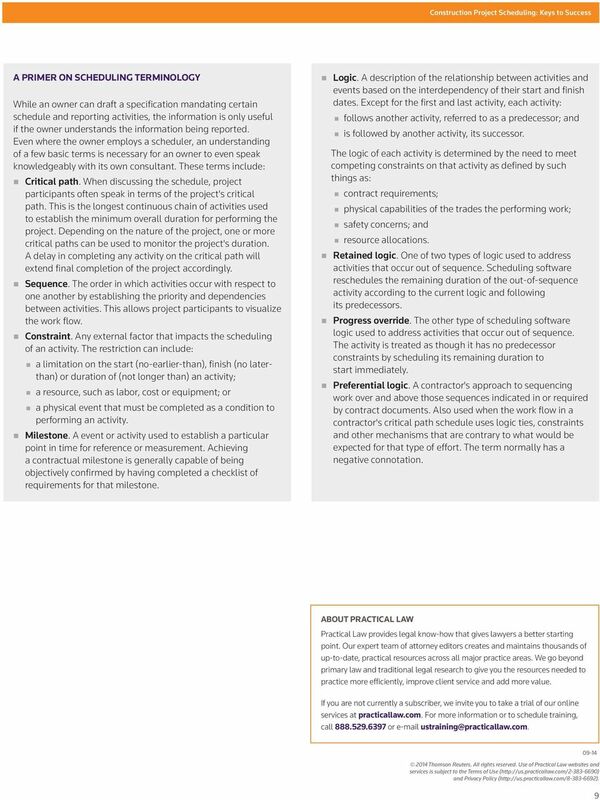 Examples of key activities to be detailed in the schedule. Practical solutions to ensure that the baseline schedule and all updates are reviewed and understood. 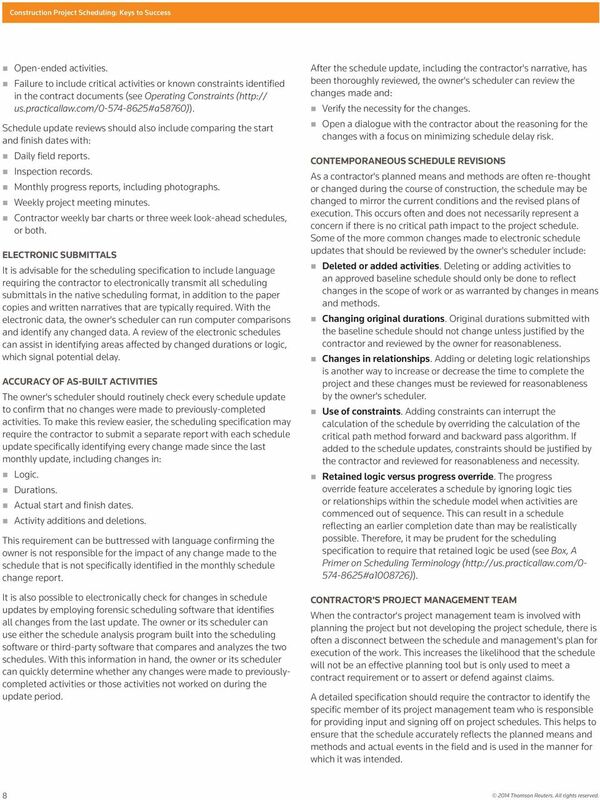 This Note also provides basic definitions of commonly used scheduling terms (see Box, A Primer on Scheduling Terminology ( PURPOSES OF PROJECT SCHEDULING Scheduling requirements on a construction project help ensure that all activities required by the contract documents to be performed by the contractor to complete the work are: Properly planned. Adequately staffed. Appropriately coordinated. Executed in an orderly and expeditious manner. 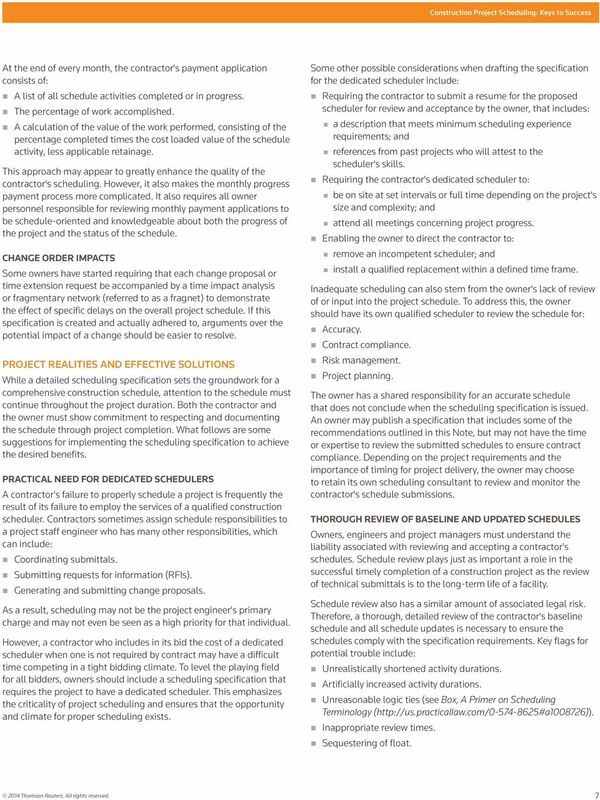 Schedules also contribute to the owner's decision-making regarding the evaluation of: The contractor's monthly progress payment applications (see Practice Note, Payment Provisions in Construction Contracts: Drafting Strategies: Payment Application Process ( us.practicallaw.com/ #a694718)). 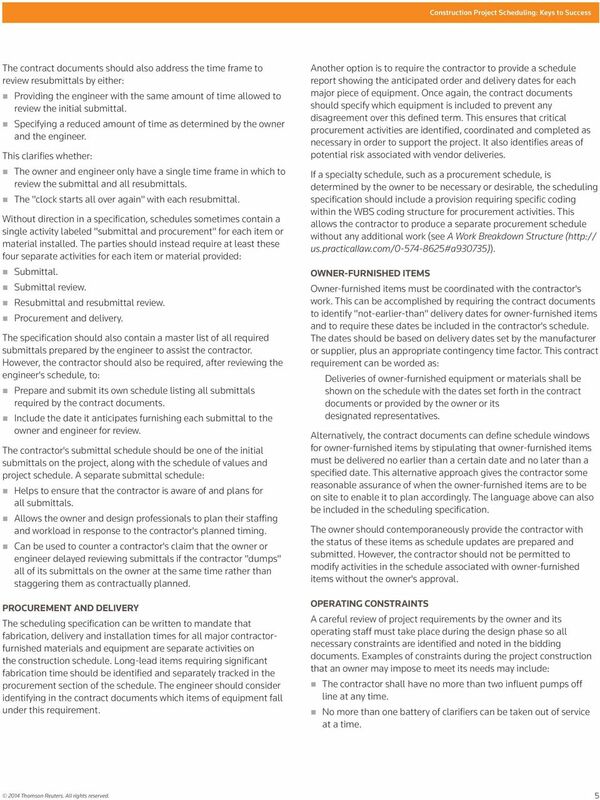 Proposed changes to the contract, including whether the contract time should be extended. 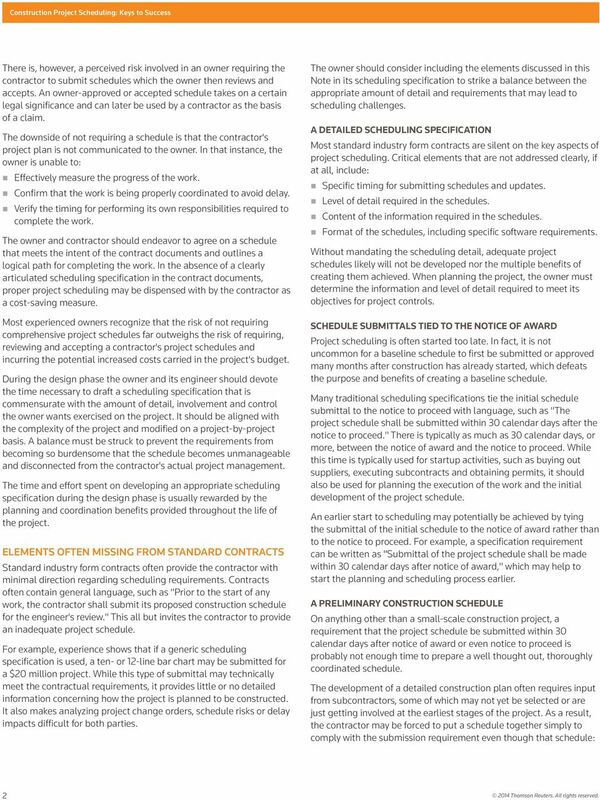 Depending on the nature and scope of the project, a construction schedule can be as simple as a list of activities that are organized in a logical, time-scaled sequence. However, on large construction projects such simple schedules are likely not adequate to meet their intended purpose. Linbeck Construction used the Last Planner system of production control on a $22 million remodel of the Chemistry Building at Rice University.